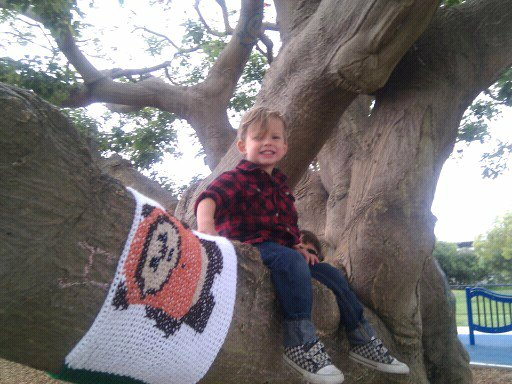 Today (mother's day) I took paul and finnegan out for a stealthy little yarnbombing session. We try to expose finnegan to everything life has to offer, even if it is just promoting his mom's weird love of crocheting and ewoks. If you head over to Glen Alla Park in Marina Del Rey, you'll see it. me: lotion after bath, finnegan? me: what about this magic pixie lotion? finn: are they nice trolls? I guess I chose the ewok because the fantastical world and the real world are never really separate in my kid's eyes...do ewoks live in trees? to him....they sure do. 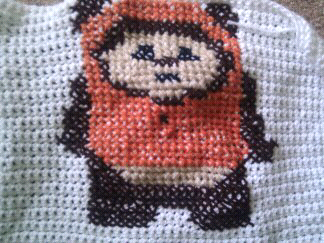 I wanted my ewok to be a little reminder of that. So, if you didn't get to see it...Sorry..and if you did.... lucky you...and if you stole it...for shame.